Lady Shelley & I shall get him a pretty little Benefit, & he will have ten Guineas from me beside, for teaching Hester to sing: his Journey to Brighton will be a lucky one, he has lost some of his Voice by relaxation,—the Sea will restore it. but if he is ever so worthy, ever so lovely, he is below me forsooth : in what is he below me? in Virtue—I would I were above him; in Understanding—I would mine were from this Instant under the Guardianship of his:—in Birth—to be sure he is below me in birth, & so is almost every Man I know, or have a Chance to know;—but he is below me in Fortune—is mine sufficient for us both? more than amply so. does he deserve it by his Conduct in which he has always united warm notions of Honour, with cool attention to Œconomy; the Spirit of a Gentleman with the Talents of a Professor ? how shall any Man deserve Fortune if he does not? but I am the Guardian of five Daughters by Mr Thrale, and must not disgrace their Name & Family—Was then the Man my Mother chose for me6 of higher Extraction than him I have chosen for myself? No.—but his Fortune was higher—I wanted Fortune then perhaps, do I want it now? Not at all. but I am not to think about myself, I married the first Time to please my Mother, I must marry the second Time to please my Daughter—I have always sacrificed my own Choice to that of others, so I must sacrifice it again:—but why? Oh because I am a Woman of superior Understanding, & must not for the World degrade my self from my Situation in Life. but if I have superior Understanding, let me at least make use of it for once; & rise to the Rank of a human Being conscious of its own power to discern Good from ill—the person who has uniformly acted by the Will of others, has hardly that Dignity to boast, but once again I am Guardian to five Girls; agreed—will this Connection prejudice their Bodies, Souls, or Purse? my Marriage may assist my Health, but I suppose it will not injure theirs:—will his Company or Companions corrupt their Morals; God forbid, if I did not believe him one of the best of our Fellow Beings I would reject him instantly. Can it injure their Fortunes? and could he impoverish (if he would) five Women to whom their Father left 20,000£ each—independent almost of Possibilities? I will however resolve on nothing, I will take a Voyage to to the Continent in Spring; enlarge my Knowledge, & repose my Purse: Change of Place may turn the Course of these Ideas, and external Objects supply the room of internal Felicity. If he follows me, I may reject or receive at Pleasure the Addresses of a Man who follows on no explicit Promise, nor much probability of Success, for I wd really wish to marry no more without the Consent of my Children, (such I mean as are qualified to give their Opinions:) & how should Miss Thrale approve of my marrying Mr Piozzi? here then I rest, & will torment my Mind no longer, but commit myself as he advises to the Hand of Providence, & all will end all 'ottima Perfezzione,8 & if I am blest with obtaining the Man—the only Man I could have loved, I verily believe it will be only because the Almighty will not leave such Virtue as his—unrewarded. In October 1782 Hester - who was involved in a lawsuit with Lady Salusbury and straightened for money - left Streatham for her Brighton home. Johnson followed her. After a violent scene with Queeney, Hester returned to London and resolved to give up Piozzi. 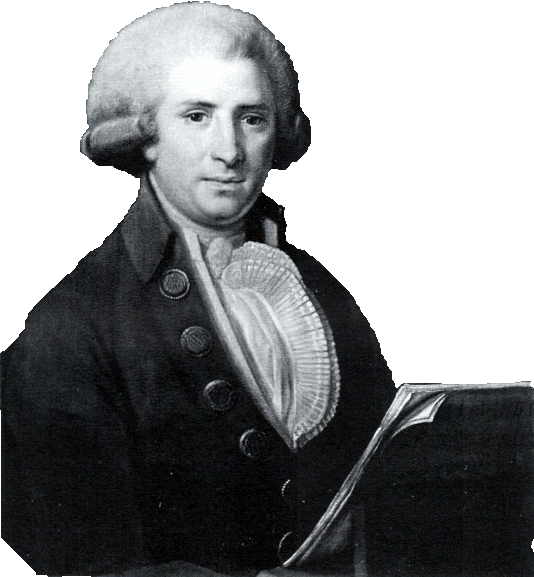 In January 1783, Hester told Piozzi that they must part. Hester retired to Bath and on 8 May 1783 Piozzi left for Italy. Her daughters on seeing that Hester's health was affected consented to the recall of Piozzi. Johnson was not in love with Hester Thrale, although he had an intelligible feeling of jealousy towards anyone who threatened to distract her allegiance. This of course came to a head shortly before her remarriage when they exchanged parting letters. The resulting estrangement saddened last months of his life. The happiest Day of my whole Life I think—Yes, quite the happiest; my Piozzi came home Yesterday & dined with me: but my Spirits were too much agitated, my Heart too much dilated, I was too painfully happy then, my Sensations are more quiet to day, & my Felicity less tumultuous. I have spent the Night as I ought in Prayer & Than[k]sgiving—Could I have slept I had not deserved such Blessings. May the Almighty but preserve them to me! He lodges at our old House on the South Parade: his Companion Mecci is a faithless treacherous Fellow—but no matter! Tis all over now. Following the wedding, Hester was cut off by most friends and relations, except the late Henry's dearest friend Arthur Murphy. To marry a foreigner and a Roman Catholic was unacceptable in society at that time. Queeney refused to recognise the new father, and shut herself up in a house at Brighton with a nurse, Tib or Tibson. The two younger sisters, who were at school, lived afterwards with Queeney (aged just 20). On 4 September 1784, they left for Italy where they spent the winters in Milan and the summers in Florence. 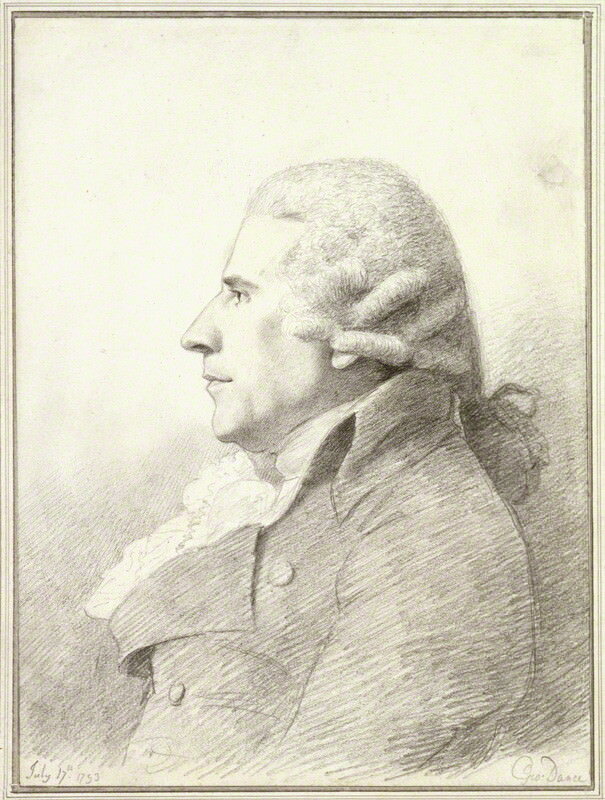 Only the fourth daughter, the youngest9, went with them to Italy, where Hester made friends with Robert Merry (1755-1798) and contributed to the Florence Miscellany. 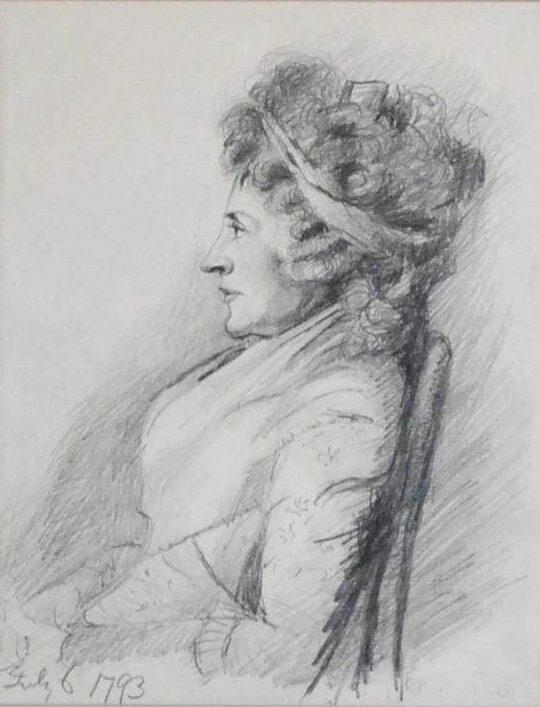 When many old friends remained aloof, Mrs. Hester Piozzi drew around her a new artistic circle, including actress Sarah Siddons. Her pen remained active, and thousands of her entertaining, gossipy letters have survived. She retained to the end her unflagging vivacity and zest for life. On 7 January 1788, Hester wrote of a miscarried daughter. In January 1798 Hester and Gabriel adopted the five year old son of Giovanne Battiste (Giambattista) - Gabriel's favourite brother who they renamed John Salusbury Piozzi. In 1790 Hester recorded their seventh wedding anniversary party at Streatham Park. 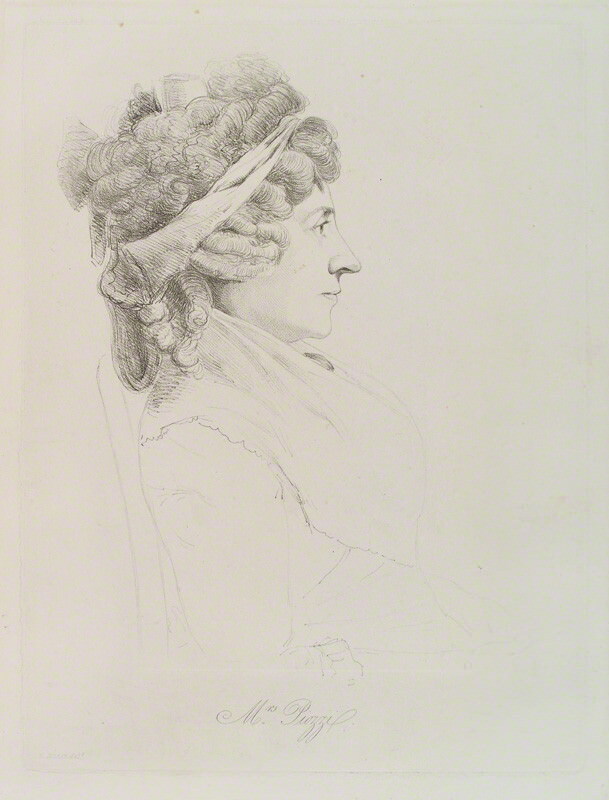 In August 1794 Hester became Godmother to Cecilia Siddons 1794-1868 - named after Cecilia Thrale - daughter of Sarah Siddons. In 1795 they took up residence at Brynbella - a house they built in North Wales on Hester’s Bach-y-Graig estate. They also renovated Bach-y-craig. Hester and Gabriel Piozzi seem to have spent most of their winters in Bath. On the occasion of their 19th wedding anniversary, Hester wrote verses of celebration. Aside from the terrible rheumatic pain suffered by Gabriel Piozzi, they both lived in happiness until Piozzi's death from gout at Brynbella on 26 March 1809. Piozzi was buried outside the north side of in the family vault in Tremeirchion church. Piozzi left Hester £6,000, and other legacies to all his brothers in his will. Hester and her adopted son, John, remained at Brynbella for five more years until he married Harriet Maria Pemberton of Ryton Grove Shropshire on 7 November 1814. Hester then left John the whole of her Welsh estate, and she retired to Bath, where she took temporary lodgings in New King Street, before taking permanent residence at 8 Gay Street, Bath. 2. Henry Salusbury Thrale died 23 March 1776 aged ten years. 11. Sixpence in pre-decimalisation money or 2½ pence. I worked at 8 Gay Street from about 1982-89, very happy days, lovely old building. There is a plaque there to record Mrs P occupancy. Amazing to touch history, seems like old buildings retain some memory of past events, makes one think.